Is this a real Chile con Carne? I know, I know... a purist wouldn't allow the name transfer from 'ragout' to 'chili', but we live in busy worlds and we need short-cuts every now and then. So here's one that's authorised, healthy and very tasty! Essentially; this is all about adding Mexican spices and beans to your pre-prepared ragout sauce. The chocolate and espresso combine to give a smoky depth to the sauce... try it! If you're making large quantities (which I have to do for my family), get ready to portion it up in plastic bags for cooling or freezing. 1/ Increase the proportion of onion slightly by frying up a chopped onion gently for 10 minutes; then adding the chile pepper for 2 - 3 minutes. 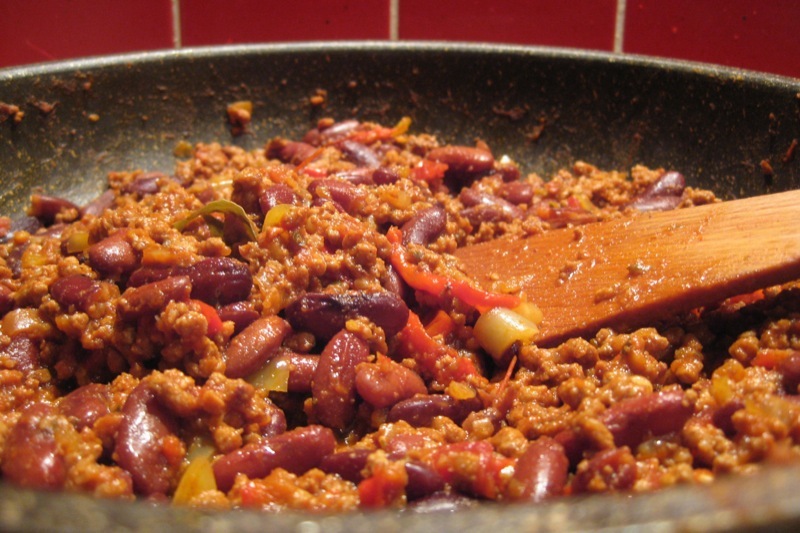 2/ Combine with ragout and add all other ingredients except the beans. 3/ Simmer for 20 minutes; then add the beans. 4/ Add salt and pepper to taste. By all means increase the quantity of chilis or chili powder, if desired!